Ayusa International is currently seeking volunteer U.S. host families in Colorado interested in hosting a foreign exchange student for the upcoming 2015-2016 school year. ... we shared cultures, religions, foods, traditions, music and movies ...we shared accomplishments and disappointments with each other. We truly became a family and will continue our relationship for a lifetime. Ayusa International, a non-profit organization that has promoted global learning and leadership through high school student cultural exchanges for more than 34 years, is intensifying its annual search for families in Colorado interested in hosting international students for the 2015-2016 school year. Ayusa hosts families who open their home to exchange students contribute to the global community as public diplomats for greater international understanding. Each host family and student creates a lasting relationship that spans the cultural differences between their two nations. Ayusa works with diverse families who are interested in hosting an international student of high school age. Families without children, empty nesters, military families, retirees, and single people are all welcome. Ayusa families come from all 50 states and reside in rural, suburban and urban communities. 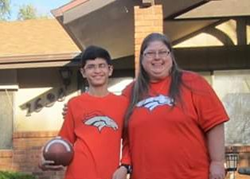 “Hosting an exchange student is an amazing and heartwarming experience, said Cheryl Blair of Greeley, Colorado. “This past year I hosted Mohammadarsh or “Arsh,” a young man from India who attended University High School. We shared cultures, religions, foods, traditions, experiences, music, and movies. He learned to love the Denver Broncos, and I learned to love Indian movies. Together we went shopping, did chores, and cooked; we shared accomplishments and disappointments with each other. We truly became a family and will continue our relationship for a lifetime, despite the distance between us,” she added. Host families provide the exchange student with three meals a day and a bedroom (private or shared). A professionally trained Ayusa representative supports each host family, student, and local school throughout the program year. Ayusa’s exchange students are 15-18 years old and come from more than 60 countries around the world. All students are fully insured, bring their own spending money and are proficient in English. Interested families can learn more about the program and available exchange students, and request additional information by visiting http://www.ayusa.org or calling 1-888-552-9872. The process to apply is simple. Families complete the online application, which includes questions about themselves and local high school, references, and a background check. Once the application is submitted, the local Ayusa Community Representative will conduct an in-home interview. They can also help each family with any questions they may have about the application or process. After families are fully approved, they can select the Ayusa student they would like to host. Ayusa International (http://www.ayusa.org) is a 501(c)3 non-profit student exchange organization founded in 1981 and an official U.S. Department of State designated Exchange Visitor Program Sponsor. In addition, Ayusa administers high profile grant programs funded by the U.S. Department of State and other organizations. Ayusa is a sister company of Intrax, a family of organizations that provides a lifetime of high-quality educational, work and volunteer programs that connect people and cultures. Intrax is headquartered in San Francisco with offices on four continents.